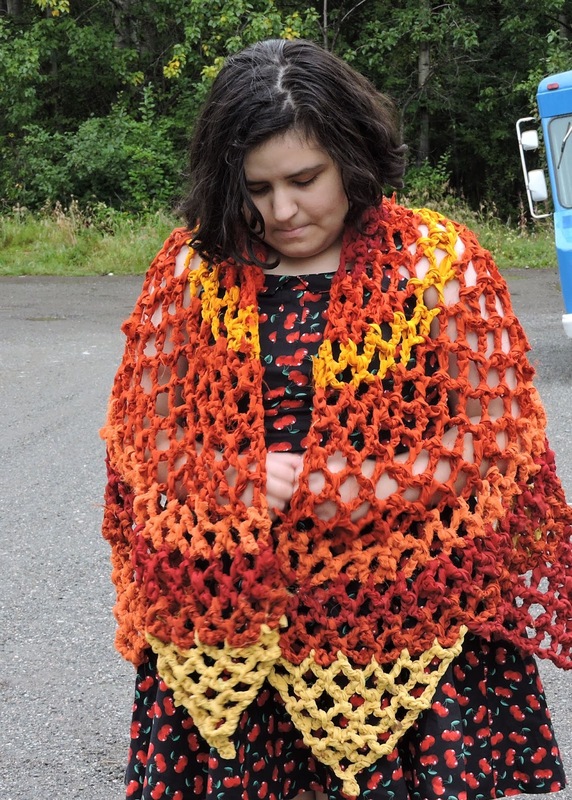 So this shawl has a bit of a story. 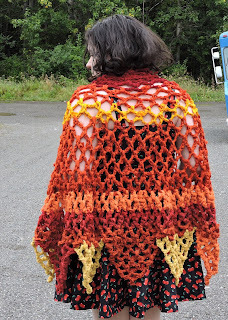 When I finished my rainbow shawl- I had some yellows, oranges and reds leftover from the yarn sets I ordered for it. 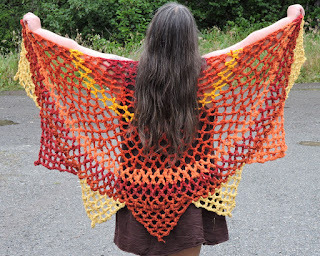 So I thought "Hey, I could make a sunshine shawl! and started it promptly with the idea it would be a simple half round with points! It took a couple starts and restarts, but it did work out. However, I didn't keep notes, figuring I'd count it all up to write the pattern. But then within a day or two after showing it off and promising a pattern, I got a nasty virus and the idea of trying to work out the pattern was just more than I could handle. This is one of my husband's favorite shawls on me. I'm not sure why, but he really likes this one! There will be some leftover. I'm kind of guessing since some of it was leftover from the first shawl. Because of the nature of the yarn, you can knot in color changes. Each odd number round begins ch 5, sc in first loop, and ends with ch 2, dc in first sc of previous round. Each even number round is ch 1 to turn, sc in same stitch, ch 5, sc in next loop all the way across, then ends in ch 5, sc in 3rd chain from first ch 5 of the previous row. So the even number rounds have 1 less loop than the odd number round before it. The odd number rounds have the increases, which are chain 5, sc in same loop. Start the next point in the same stitch as the end of the row 1 of the previous point. 7 points total. I used yellow for every other point, then used other colors in between the yellow. Adapt the points to the colors you have left after working the body of the shawl. So beautiful, thank you for sharing your pattern, making one as we speak! I love this shawl! But, I'd like to make this out of Caron Simply Soft instead of bulky. Is it possible? What type of changes would I have to do? I also love your rainbow shawl. Might have to be the next one, but no in bulky.